Sales in the restaurant industry can be extremely volatile. With seasonality, external competition, and a number of other factors at play, it's often difficult for restaurant operators to not only get a grip on their restaurant sales, but also increase them. What many restaurateurs fail to see though, is that even the most popular restaurants around town have the potential to easily improve their sales. If you are trying to increase sales at your restaurant, this article goes through 11 strategies you could follow to help get a grip on your management and push your restaurant to higher sales. One of the most important and easiest ways to increase sales at your restaurant is by upselling your customers. All things considered, your restaurant staff are technically in sales, and they need to be reminded to make it their top priority. Think about your average ticket price; now imagine increasing that up to 10%. Over the course of a year this means serious increases in revenue. How to upsell your restaurant customers? If you have no experience in upselling as a way to increase sales, here are a few tips. Ask. Sometimes its as simple as asking your customer if they want something extra. Whether it be a side of fries or a drink. Asking one question is not going to scare your customer away, so it doesn't hurt to try. Be prepared to upsell. Sometimes the opportunity to upsell your customers presents itself when you least expect it. Whether it be a confused patron asking for recommendations or a tourist that doesn’t have a complete grasp on the language. Have a set number of dishes prepared to recommend when these situations present themselves. Inform. Sometimes your upsell techniques can be disguised as friendly advice. We’ve all been there, after looking through the menu for hours we can’t decide what entrée we want to pair with our drink. Cue the ‘informative’ waiter. “ Might I suggest the 12 ounce ribeye? It goes perfectly with the salad you ordered”. Just like that you were influenced into choosing one of their most expensive dishes because of a recommendation. Samples. Sometimes its hard to convince a customer to order something they’ve never tried, especially when its so expensive. Which is why you should offer them a sample. Whether its one of your entrees or a drink, your customer is more likely to pull the trigger on a decision if they’ve already had it and liked it. Training. Train your employees to upsell. They should never leave a table without asking if a customer wants anything additional or making recommendations. Do you have one or two employees that are born to be in sales? Have them train the rest of your staff to bring them all up to speed. The hardest thing to achieve at a restaurant is a return customer. So many factors are at play when determining whether or not one of your guests is going to come back a second time or not. A study conducted by Harvard revealed that a mere 5% increase in return customers can increase a restaurant’s profits anywhere from 25% to 125%. That means bringing back 5 out of every 100 customers that dine at your restaurant. Retaining diners in crucial to marketing your restaurant. Here are a few tips to leave a lasting impression on your customers. Loyalty programs. Loyalty programs have been around forever, and they are a great way to incentivize another visit with free menu items or discounts. Reach out to them. Offer your customers a free dessert if they join your email list, and then send personalized emails with offers or special events that might make them want to come back. Happy hours. Happy hours are a great way to get customers to come back during your slowest hours. 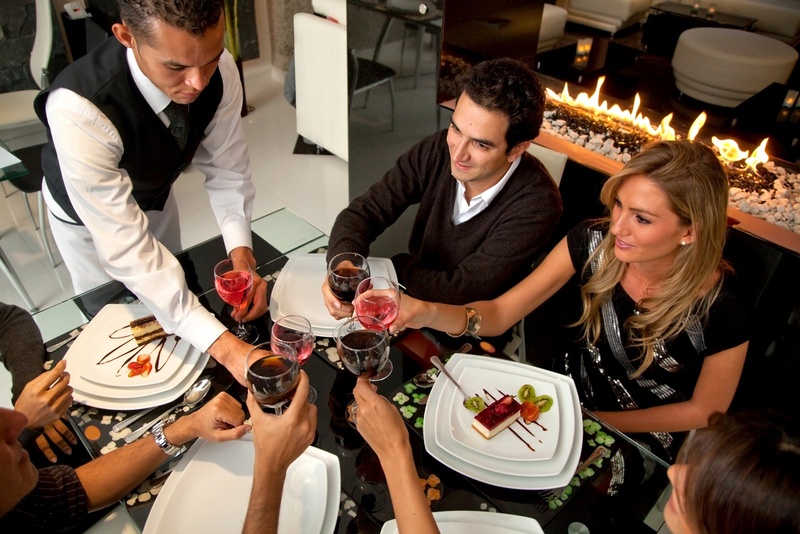 Make sure your staff informs your guests when your happy hours are and emphasize how much they will be saving. Seek out first timers. Train your staff to seek out first time customers, and make sure they get an exceptional experience at your restaurant. First impressions are hard to forget, so you want yours to leave a lasting impression. Leverage your restaurant reservation system to make this task straightforward for your staff. Never underestimate the power of online ordering. When it comes to takeout and delivery, the average ticket prices are usually 10-30% larger than when guests dine in. This is usually because customers are able to place orders from the comfort of their own home, leading them to let their guard down and order more food than they normally would when dining out. Orders made online do not require a hostess to seat your customer, nor do they require wait staff to host your guest throughout their dining experience. This brings down the cost to place an online order well below that of an order placed in your restaurant. So how exactly do you go about increasing orders placed online? Partner with on demand food delivery apps that can drive traffic to your restaurant. See the food delivery apps available worldwide in the restaurant tech landscape. We are living in the age of the internet. When one of your customers wants to decide where to go out to eat, the first place they look is online. You need to make sure you are where your customers are and that means taking reservations through your website. Using a restaurant reservation system at your restaurant that can accept online reservations is a great way to boost reservations coming from your online presence. An easy method of accomplishing this is through the use of an online booking widget. An online booking widget is a short piece of embeddable code that you can place anywhere from your website to Instagram and facebook to allow visitors to these pages to easily make reservations at your restaurant. Too many restaurants are doing things the old fashioned way. Taking reservations by hand, calculating and tracking expenses manually. Eventually this system fails, and when it does, it's often times at the expense of a paying customer. By using reliable restaurant technology, you are creating a seamless experience for not just you but your customers, ensuring that every meal goes perfectly from start to finish. Not to mention that fact that modern tech such as POS system can give you access to invaluable data, allowing you to make better business decision which will in turn influence your sales. You should be holding regular meetings with your staff to keep them in the loop about whats going on behind the scenes at the restaurant. Staff that believe a restaurant is doing well financially are not as likely to try to upsell customers or provide better service. So if numbers are down, let them know, and involve them in the solution. Similar to the last tip, you need to be maximizing your online outreach to attract as many customers as possible. One quick and easy way to accomplish this is by claiming your Google my Business account. Your google my business profile is the first thing your customers see when they google your restaurant name. Sometimes they even show up when they search a certain cuisine or area. By filling out your google my business profile, you are ensuring that any customer that stumbles upon it can quickly view your hours, contact number, location , and even directly make a table reservation or make an online order. We don’t mean to add wifi to your restaurant, even though that’s not such a bad idea. We mean establish a social media presence. In this day and age, if you haven’t created social media accounts for your restaurant, you are going to get left behind. Social media is a great way to promote your latest offers and menu items to your followers for free. And if that isn’t enough, you can pay to promote your posts to reach a much wider audience. Customers are much more likely to order an item they’ve seen online before even visiting the restaurant. A carefully crafted menu can be what drives customers to make certain decisions. Everything you’ve learned up until now goes into making your menu tailored to increasing sales. Position higher profit dishes where your customers will see them, and bench poorly performing items to experiment with new ones. If you haven’t already done so, you should definitely calculate your food cost. By knowing exactly how much each of your dishes costs, you can begin to make smarter decisions about pricing, and practice menu engineering. You may find out that your chicken salad costs you $1 to make and you are only selling it for $1.50. You could easily increase that to $4-$5 and make a much bigger profit margin. If that price jump is too high for you, you can still slowly increase the pricing on your menu over a period of time so the impact isn’t so great on your customers.